Fridays @ 7pm - this February only! Have you ever locked eyes with a barista who taught your torches to burn bright? Do you long to cry havoc and let loose the dogs of war on your idiot supervisors? 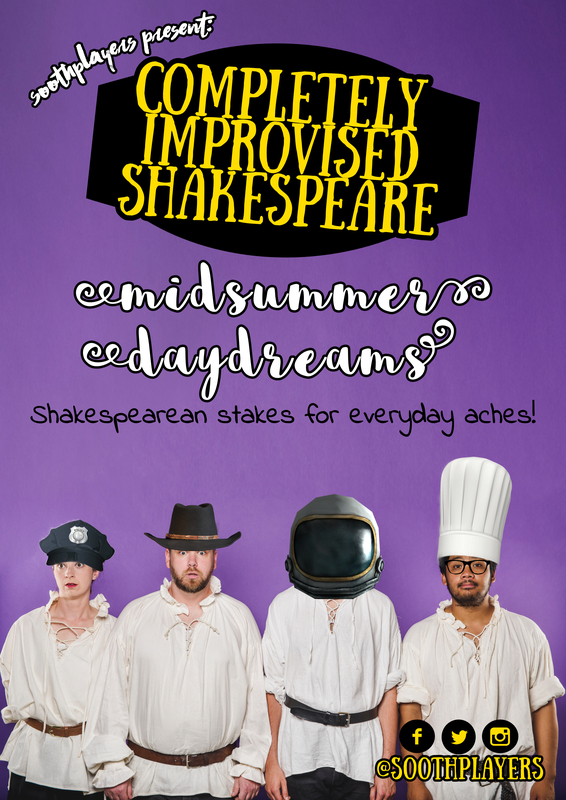 Midsummer Daydreams brings Shakespearean stakes to your daily aches. See star-crossed lovers working for rival food trucks, bloody coups over corporate restructuring, and puckish sprites making sure you send that email without an attachment. It’s your world, but with all the heart, wit, and silliness that Shakespeare has to offer. Soothplayers formed in 2015, producing their show, Completely Improvised Shakespeare at the Improv Conspiracy Theatre for the Melbourne Fringe Festival. Since then they’ve played across the country to rave reviews and sold out crowds. Soothplayers also produce Completely Improvised Potter.